Well, lucky me to have such a successful bread recipe right out of the gate! As those of us who cook gluten-free know, even when you follow an allergen free recipe exactly, it’s not guaranteed to turn out. 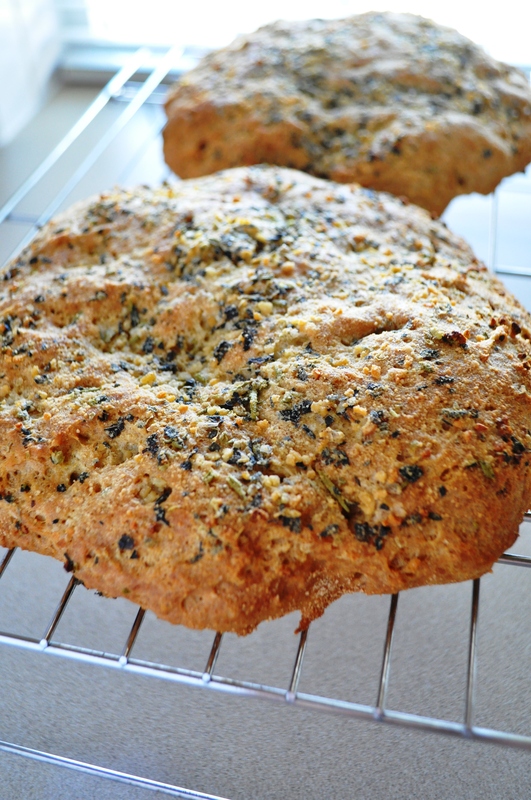 This flatbread recipe is adapted from Living Without magazine and is yeast free, gluten-free, and dairy free. It’s also incredibly easy. I cannot believe how good it is. I used all of their flour and measurement suggestions except reduced the sugar by 1 Tablespoon, used dairy free butter and dairy free yogurt instead of regular, and added the seasonings and olive oil. The next time I make it I’m going to omit the sugar all together and see what happens. Why have the sugar in there if it’s really not necessary? There’s no yeast in the bread so they can’t be using it to feed that so it must just be for flavor. I would think that the yogurt provides plenty of sugar and that the extra sugar really isn’t necessary. 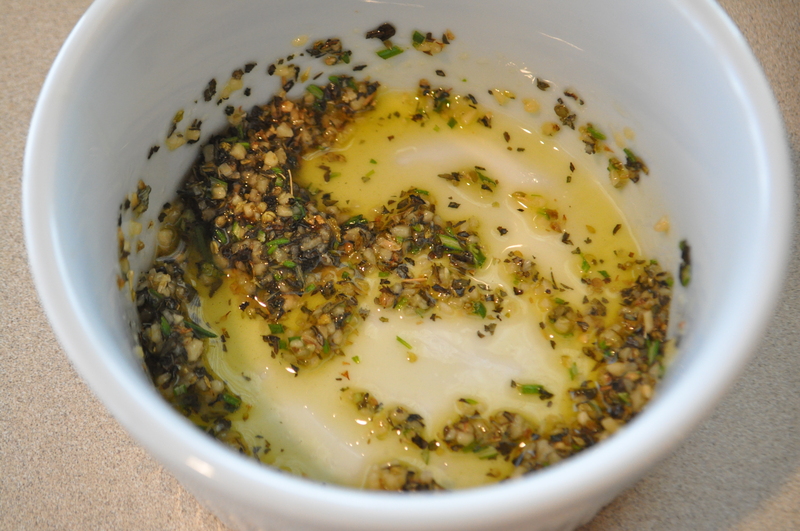 You can make it without the herbs and olive oil on top of course, or you could add other types of herbs if you like. I think it would be great sandwich bread with all types of fillings, or as an appetizer bread with olive tapenade, roasted peppers, a rich balsamic, and a nice olive oil. Line a baking sheet with parchment paper and set aside. 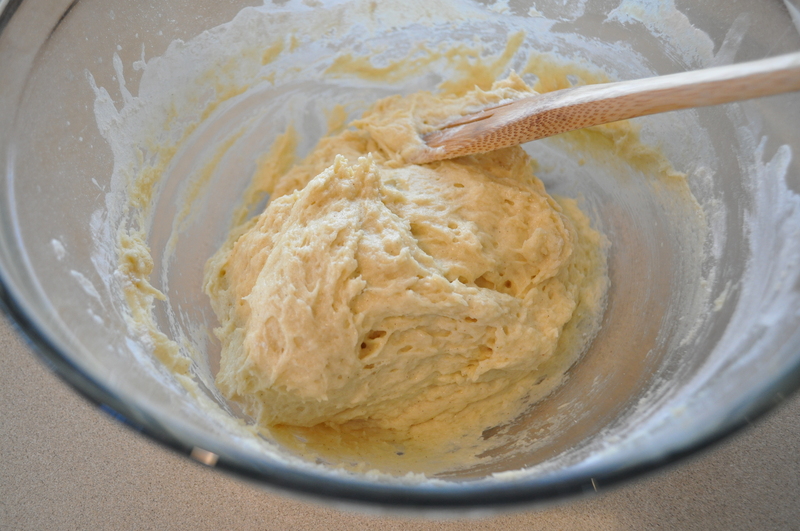 In a large bowl, whisk the flours, baking powder, baking soda, salt, and xanthan gum. Set aside. 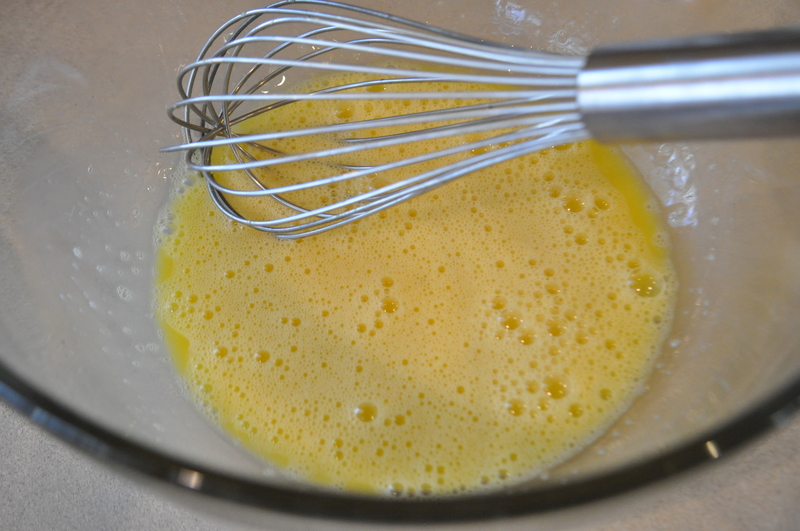 In a medium bowl, mix the eggs and sugar together until the mixture is a lemon color. Add the yogurt, water, vinegar, and stir. 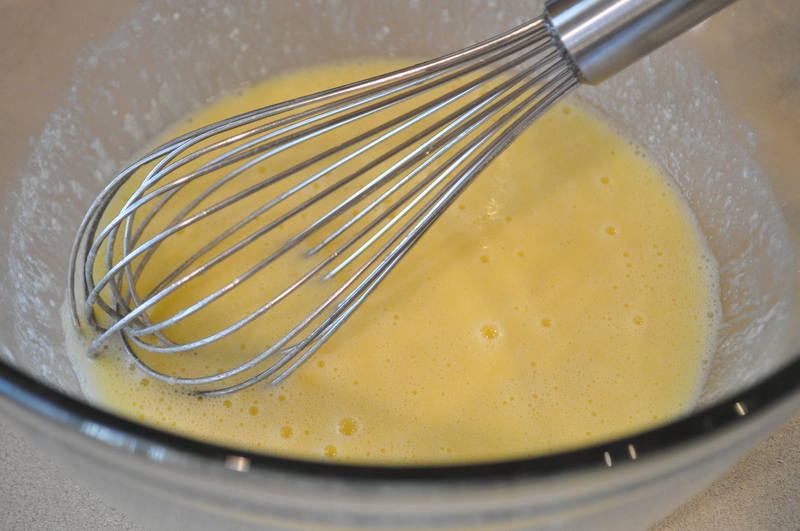 Slowly add the melted butter whisking quickly. 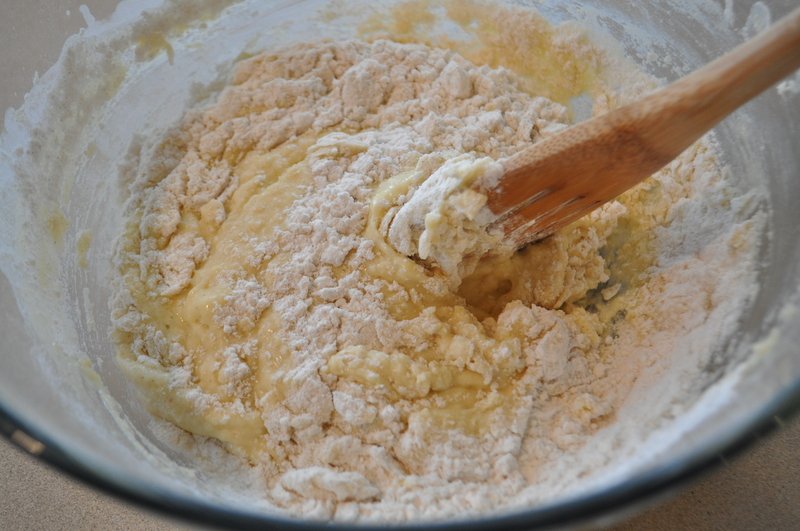 Slowly fold the flour mixture into the egg mixture. The batter will be sticky. Divide the batter in half placing each mound on opposite sides of the lined baking sheet. 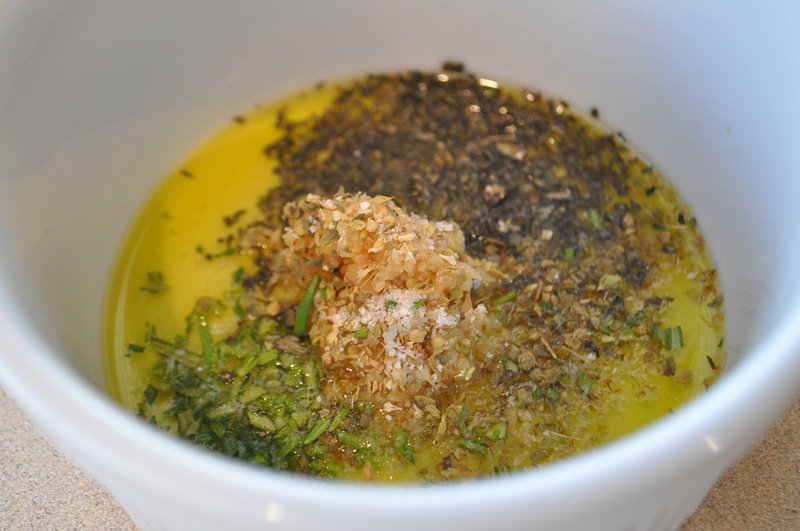 In a small bowl, add the garlic, basil, oregano, rosemary, kosher salt, and olive oil and mix. 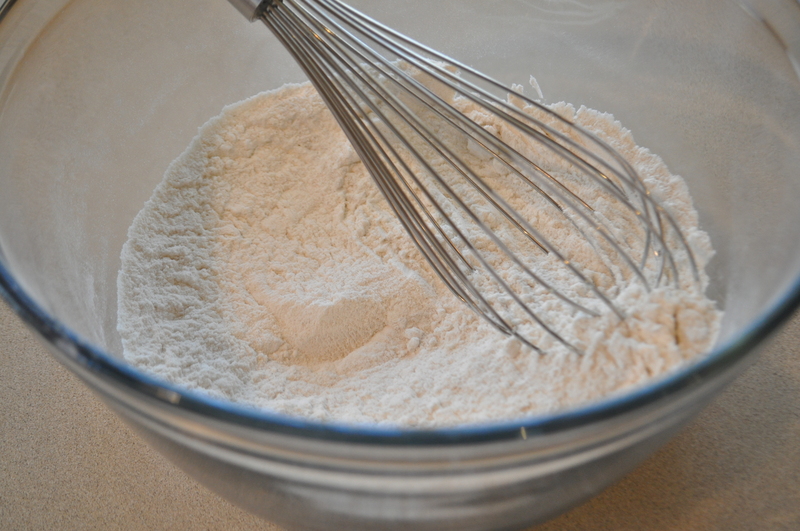 With damp hands (you may have to dampen them more than once), pat each flour mixture into a hamburger shaped mound. About 6 inches wide, brush with the olive oil mixture and sprinkle with dairy free parmesan. 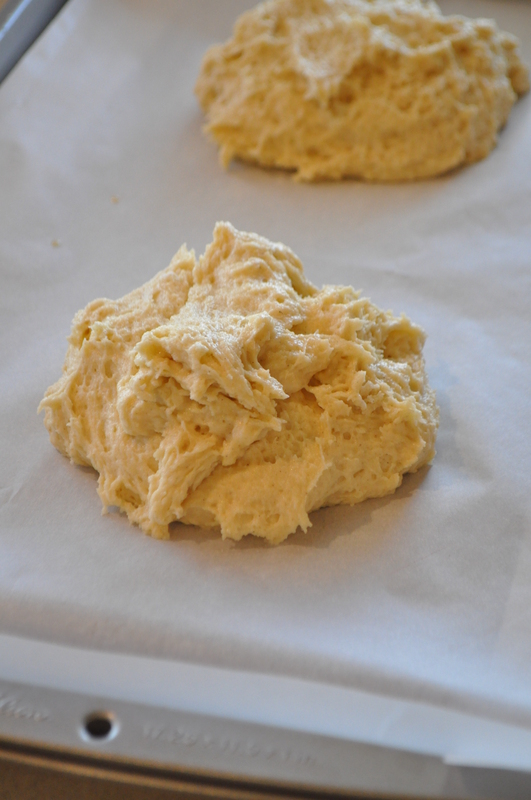 Place the dough in a preheated oven and bake for 20-25 minutes (convection). If it begins to brown too quickly cover lightly with foil. The bread is done when it springs back when touched in the middle and is golden. Cool on rack. This is about 10 minutes into the baking time. I was very excited to see it puffing up so nicely! 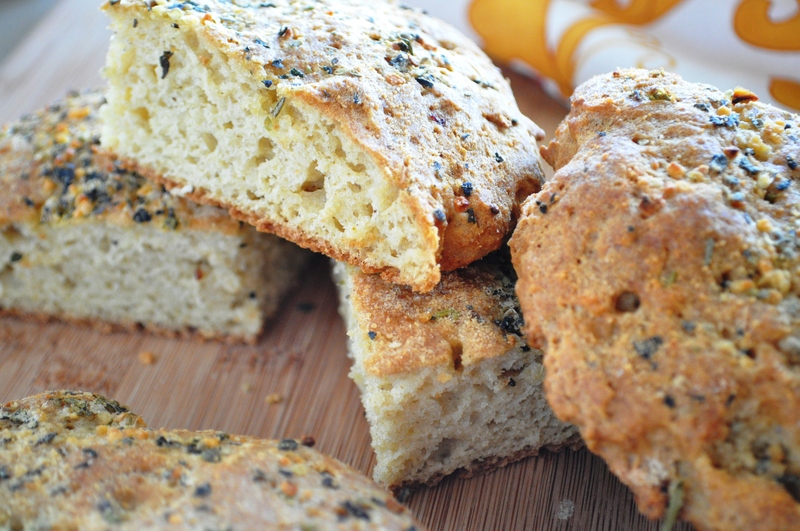 A perfect appetizer or snack bread. 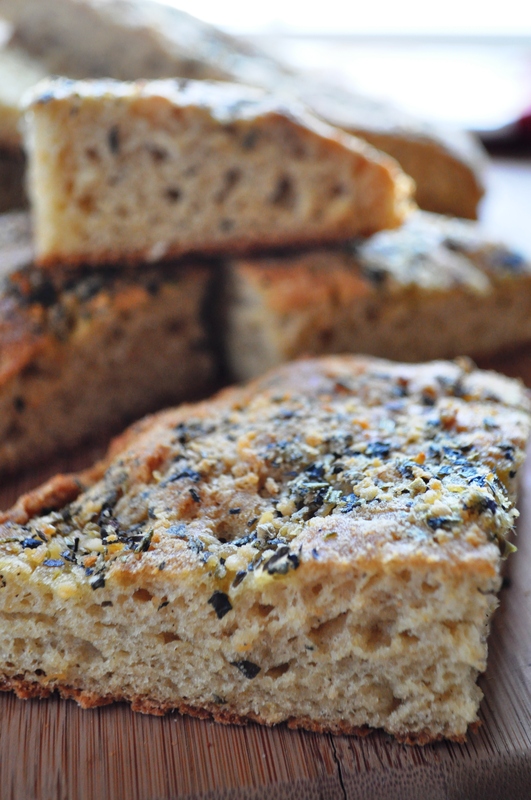 Slices very well for sandwiches with no crumbling, dry, or grainy texture. Not to mention it’s gorgeous! Beautiful enough for company and they won’t ever know they’re eating gluten and dairy free. 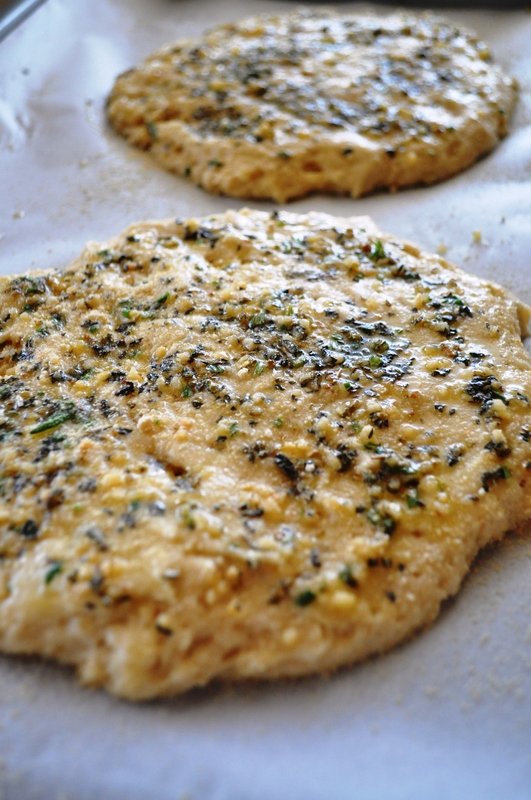 This is one good-looking flatbread! 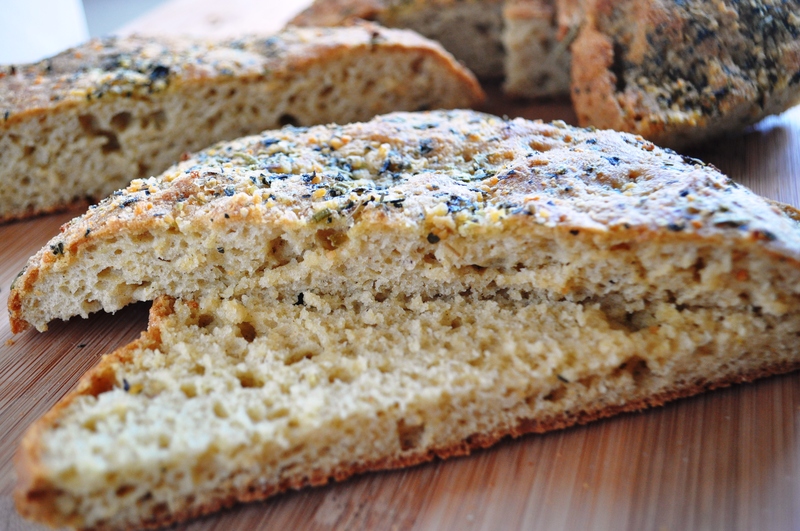 My family makes a flatbread called spianata and the crumb is very similar to this one. Just seeing it on a platter, I’d never have guessed it was gluten and dairy-free. Well done and thanks for sharing! You’re welcome! It was very easy and I am shocked at how good it is. I can see that it’s going to be my new favorite sandwich bread for a while. Next time I make it I’m going to do an oat version…we’ll see! Yay… it’s so awesome when a loaf of bread turns out, isn’t it? 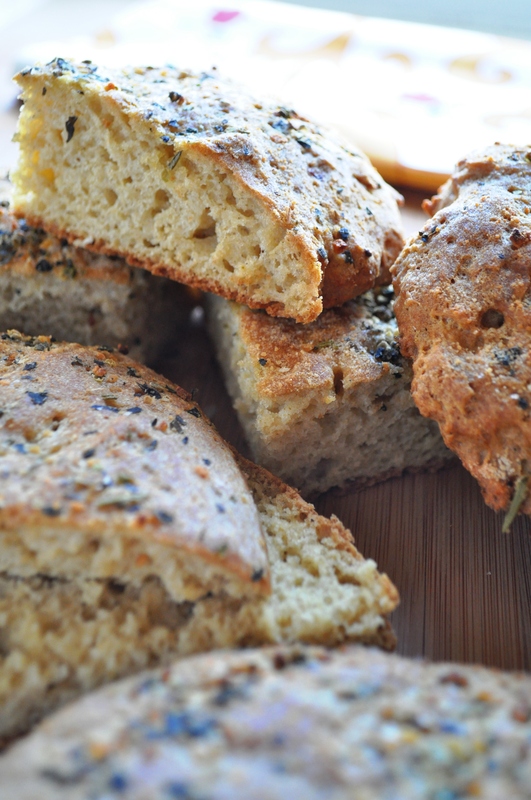 This looks fantastic.. I’ll have to pass it on to my gluten-free friend from bike class! It’s simple, simple, simple, she’ll love it! That bread looks so delicious and how would you even know it was gluten free! Love the colour of the crust. This is a great-looking recipe. I’m going to try it. 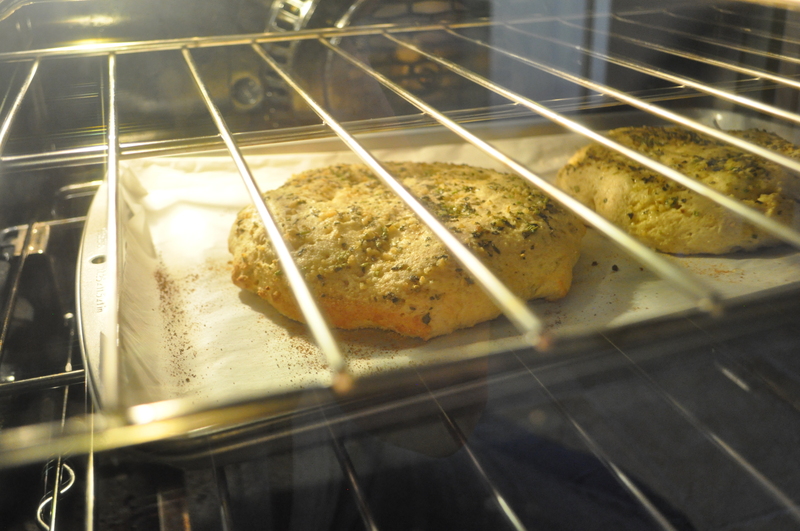 A thought though…you could double the spices and add to the dough…that might also be interesting. Or do half in and half on top. Anyway, thanks for the post!